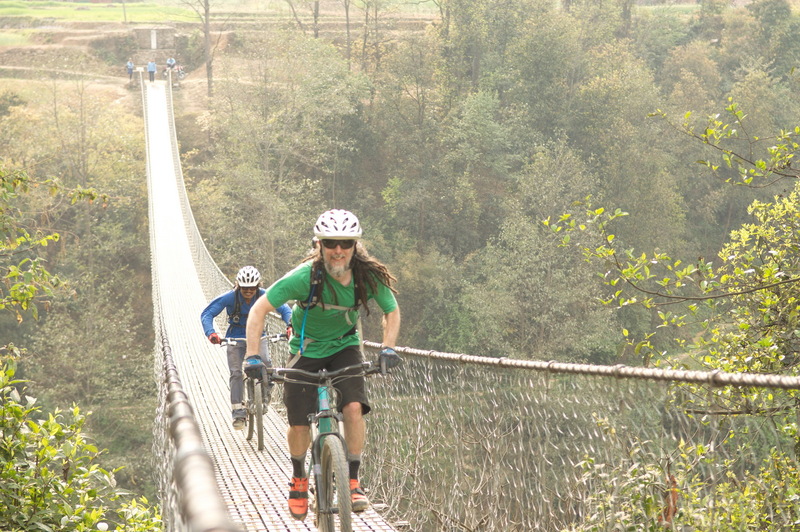 We usually do a mountain bike trip each spring but this year we had instead opted to focus our time (and especially money!) on an upcoming Sprinter van conversion project. 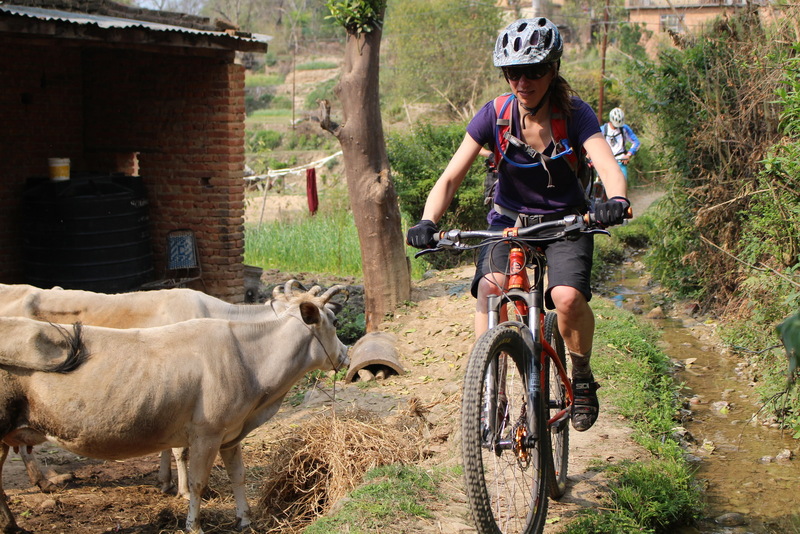 That was until we heard from my friend Bill from the Lake Placid crew: “Dude, you want to go biking in Nepal?” How could we pass on this opportunity? 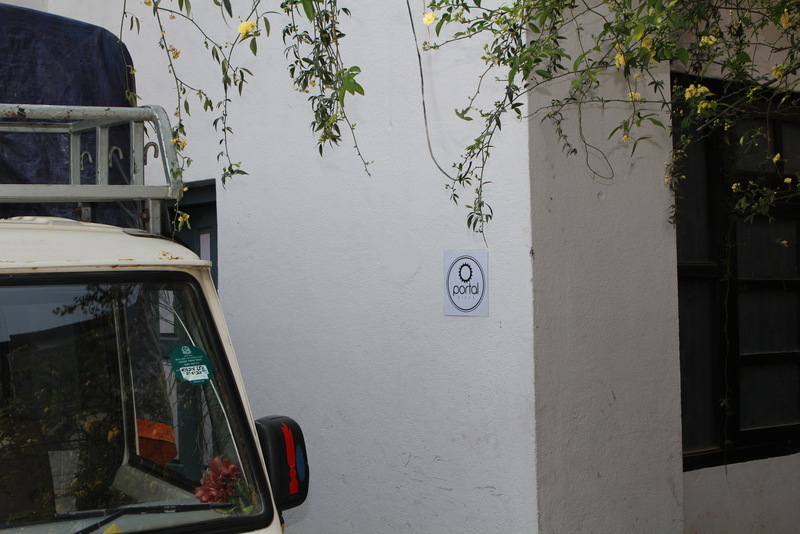 We told Bill that we would think about it… but resistance was futile– we knew we were in! 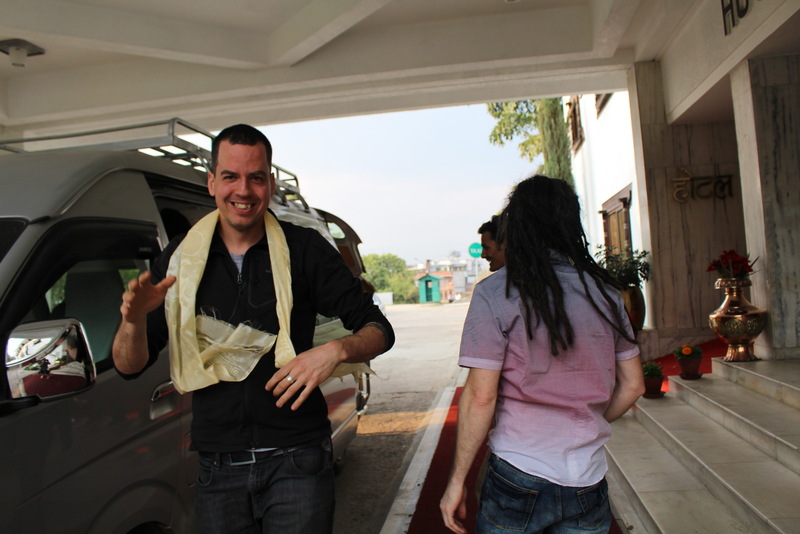 We were the first of the group to arrive in Kathmandu after a 27 hour flight. We just had time to conquer Everest before our friend Ugo, the other participant from Québec, arrived. Bill assembled a diverse group of riders for this trip, most of whom hail from Lake Placid but also Taylor, from Jackson Hole, Wyoming, and of course us 3 Quebecers. 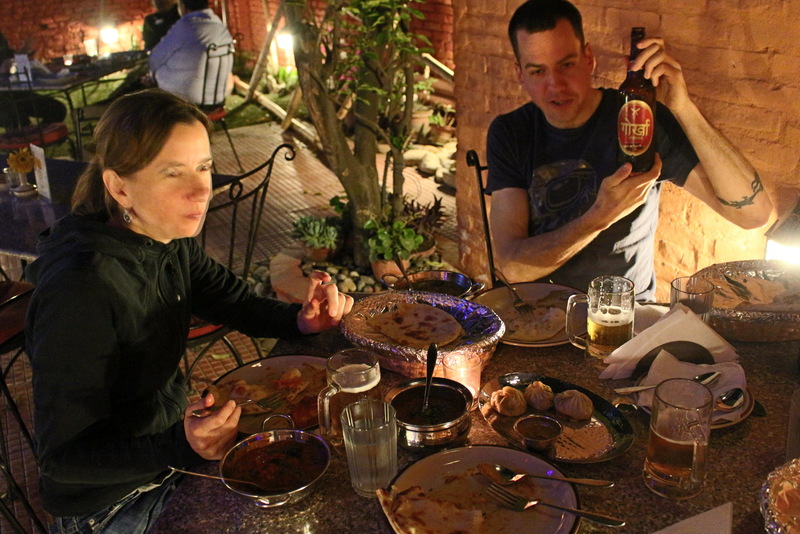 The guys from the US were arriving later that night so we ventured out to grab dinner. Next morning we enjoyed our first breakfast with the whole crew. All told, there are 10 of us. 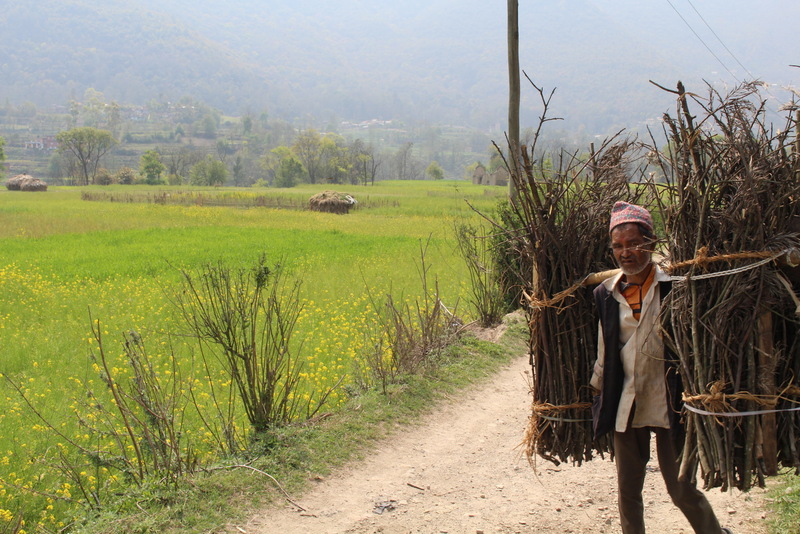 In a couple of days we will be flying to the Northern side of the Annapurna massif to the small town of Jomson. 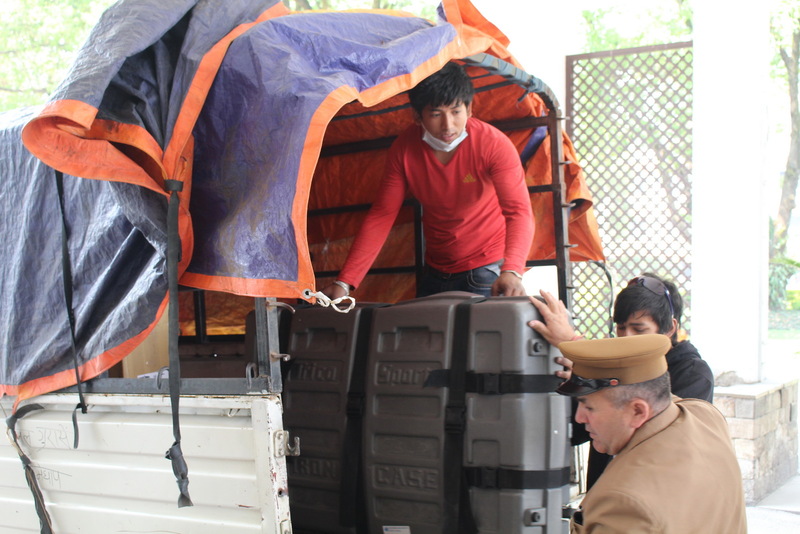 Since we are now 10 instead of 8, we aren’t able to fit all of our bikes in the small plane, and the steeds would need to remain in their transport boxes for the full-day’s drive by Jeep to Jomsom. 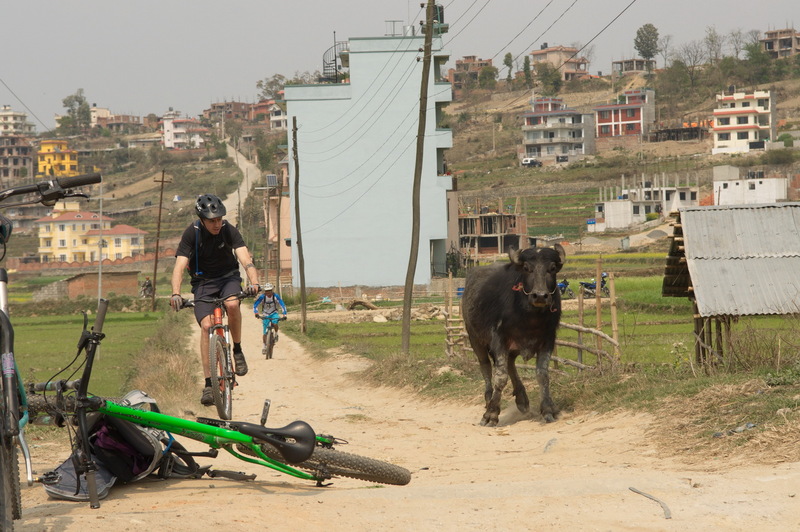 Since our bikes were travelling by themselves, our tour company Epic Rides Nepal let us use their fleet of Commencal hardtails for our first rides. 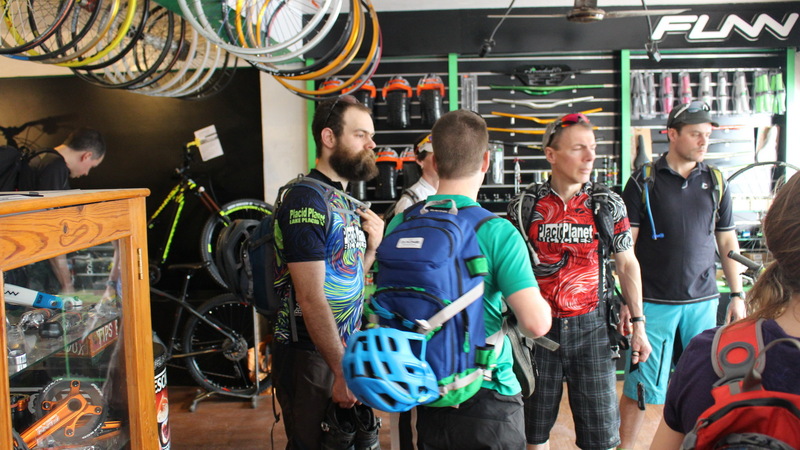 We headed off by foot to the Epic Rides offices/Bike shop to be sized up on the rigs and get ready to ride. 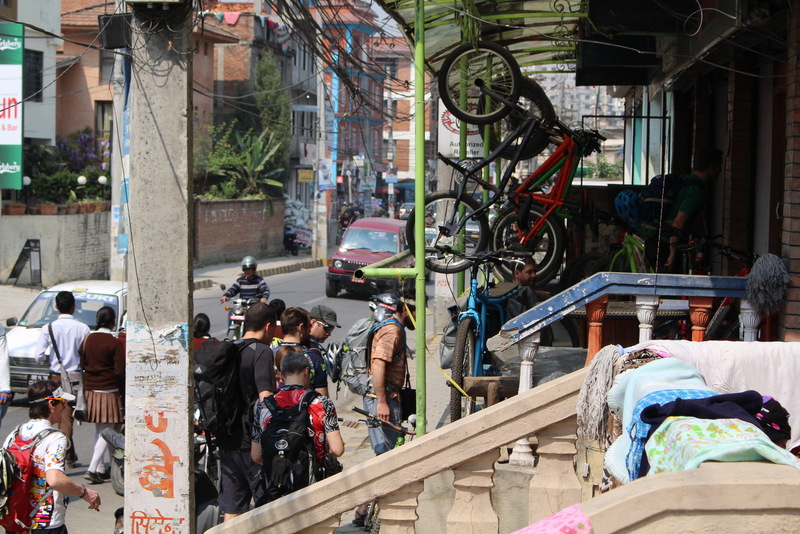 Kathmandu, like most major cities in developing countries, has crazy traffic: lots of cars, buses and motorcycles and a distinct lack of apparent rules, save perhaps survival of the biggest! I love the way that the working chaos works– all these vehicles and people are part of a giant organic system that just moves, morphs and adapts in real time. 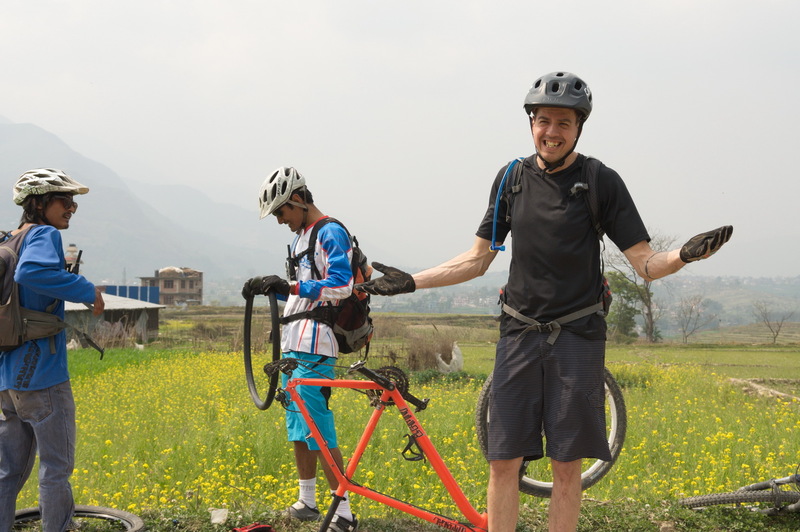 Once at the offices of Epic Rides Nepal, we received a warm welcome from the owner himself. 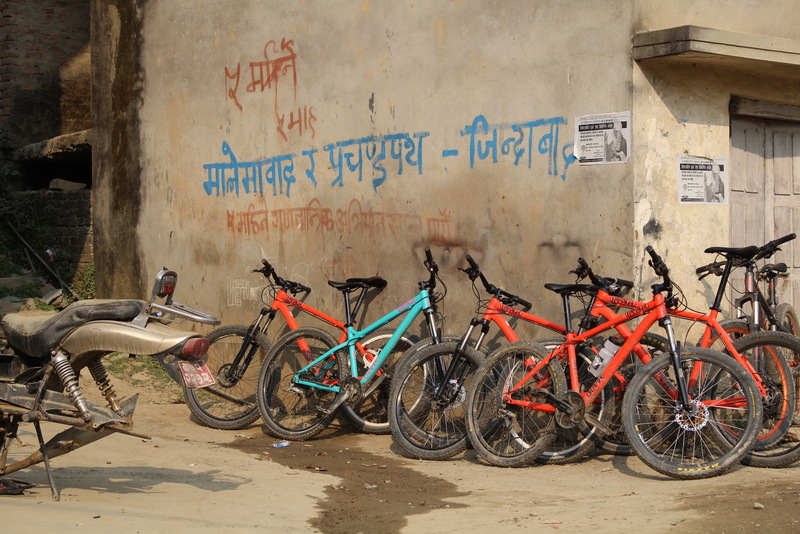 The guys at Epic Rides are incredibly friendly and we enjoyed lattes while they gave us a quick history lesson of Nepal, from the ruling days of the king, all the way to the formation of the current republic. One of their partners, Caleb Spear of Colorado, just started a very interesting project called Portal Bikes. 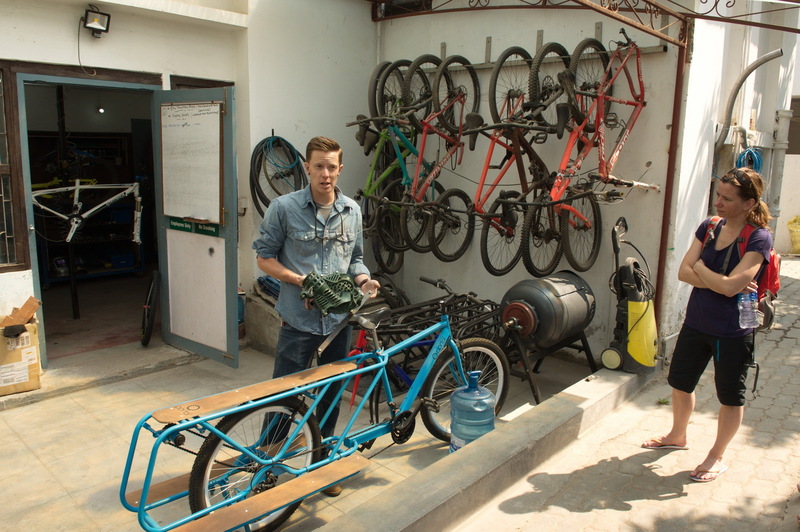 Portal Bikes is this: a cargo bike that doubles as human motor to help Nelpalis accomplish basic tasks, such as husking corn. This custom bike has a flip flop hub that connects another drive train to a PTO (power take off) that could power all sort of tools like a mechanical washing machine or even a coffee bean or smoothie grinder– I am sure the hipsters would love that! Portal Bikes from Cedar House Photography on Vimeo. 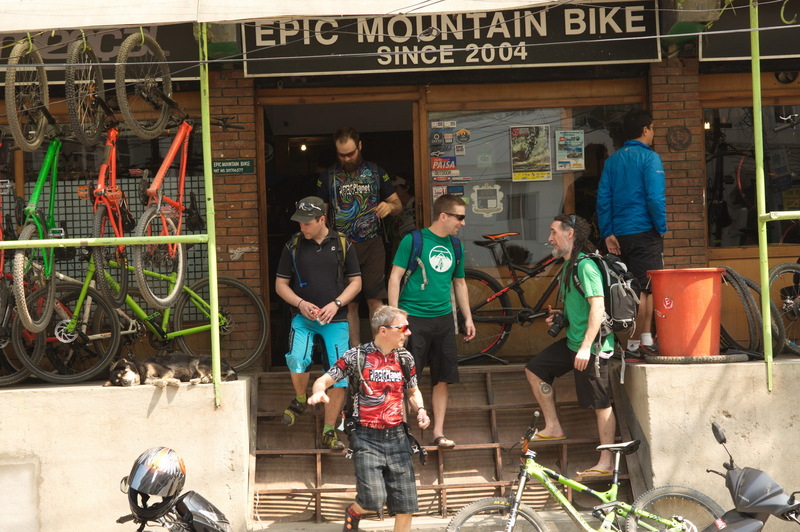 Another side of Epic Rides Nepal is their bike shop, Epic Mountain Biking, a fully stocked shop with everything even the most discerning mountain bike enthusiast would need. They carry sweet Commençal bikes. 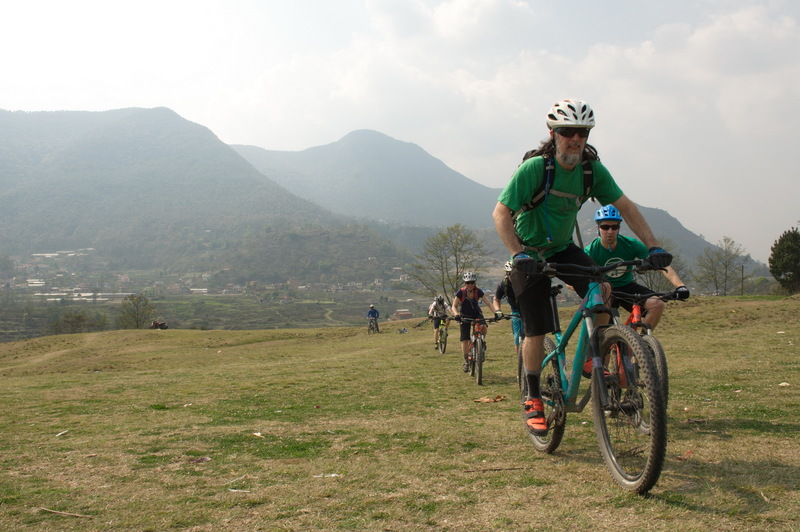 After the wonderful Nepali welcome, we were finally ready to hit the streets of Kathmandu for our first ride. 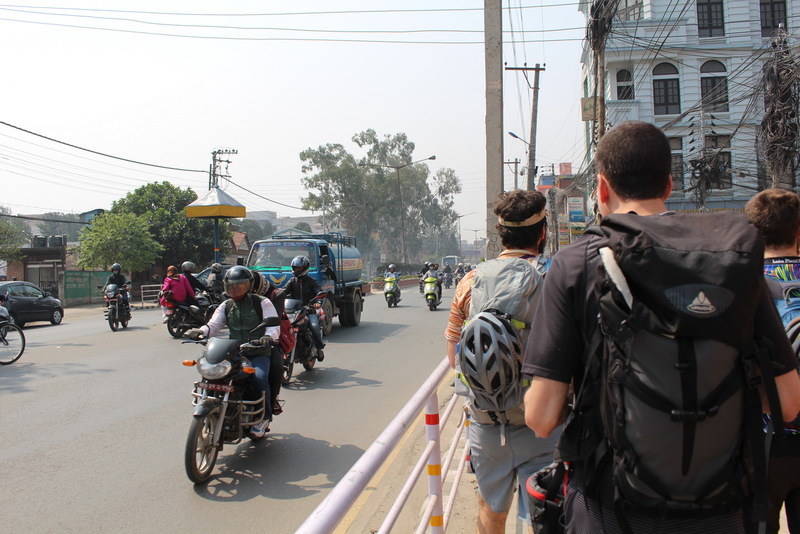 Our ride began in the busy streets of Kathmandu meaning we would quickly become part of the amazing organic system that forms the city’s transportation network. 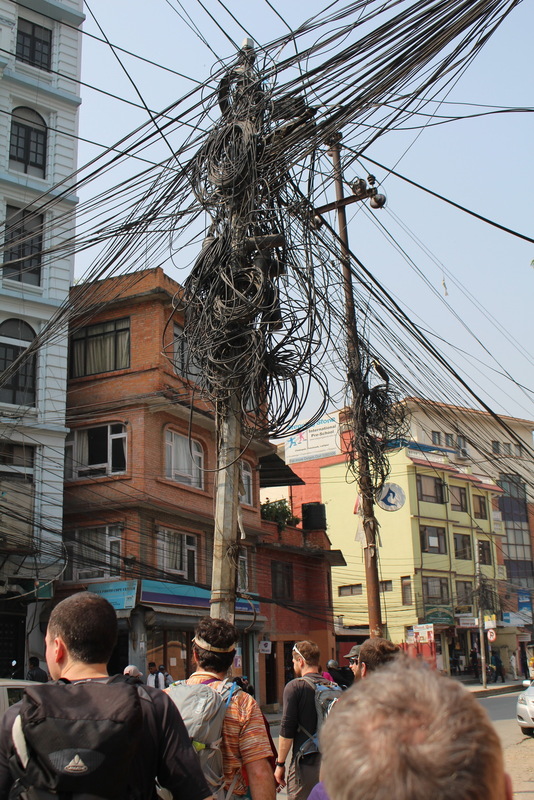 Like any other alien body getting into a system, it took a while for us to adapt. Leaving the craziness of downtown behind, we made it to the outskirts of town where we could enjoy a totally different scenery. 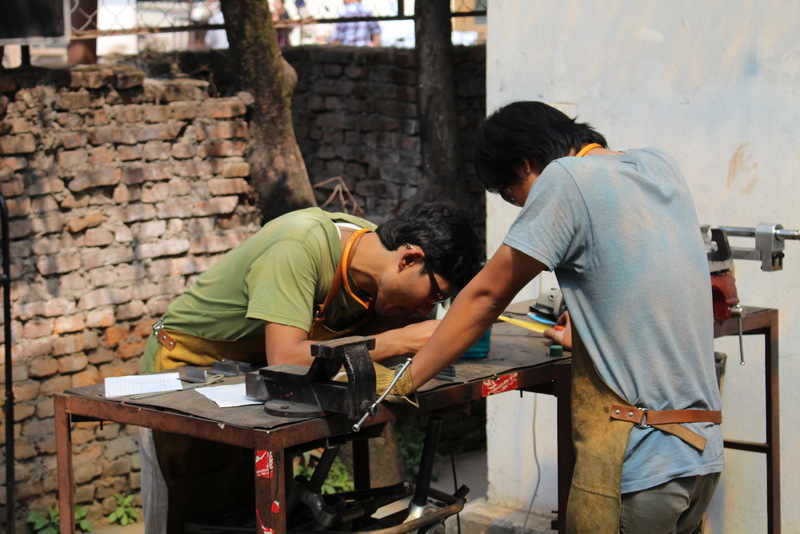 Of course, flat tires are an international thing! 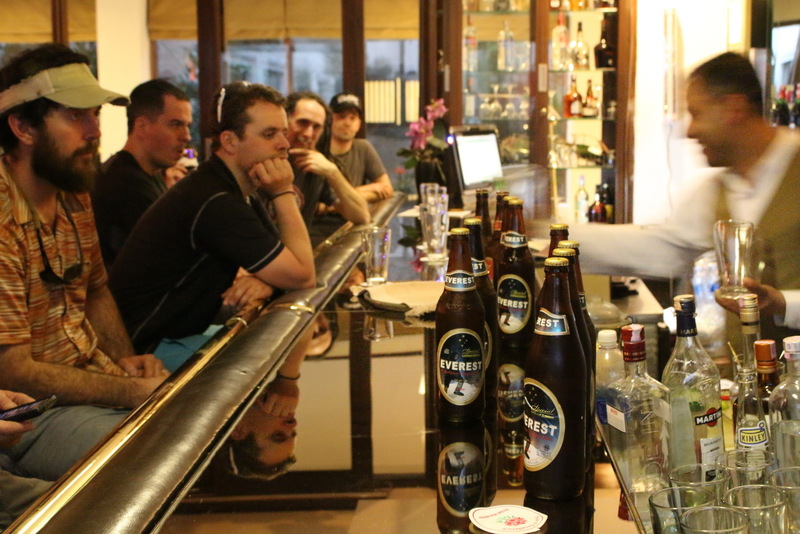 Ugo had the pay for the first round of beers for having the first flat. 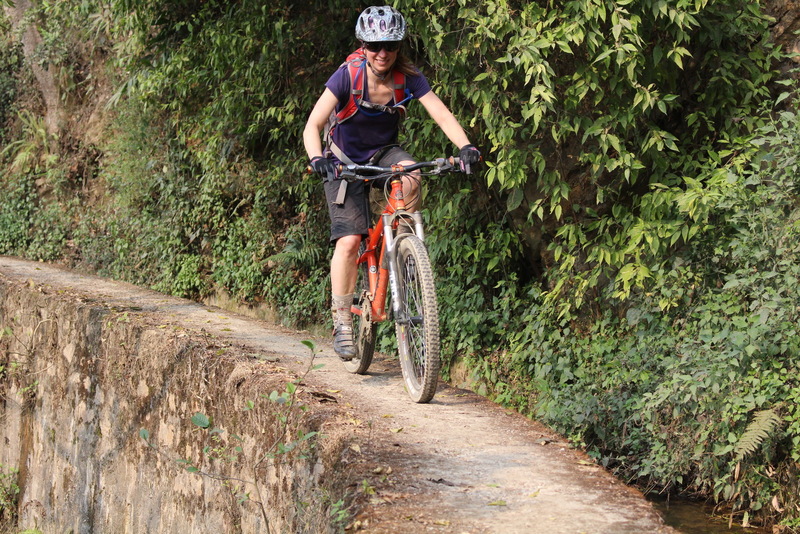 Our first ride was aptly named the Canal Ride, and we followed a very narrow singletrack adjacent a small canal used to bring water to the small towns, necessary as there’s no running water to be had outside Kathmandu. 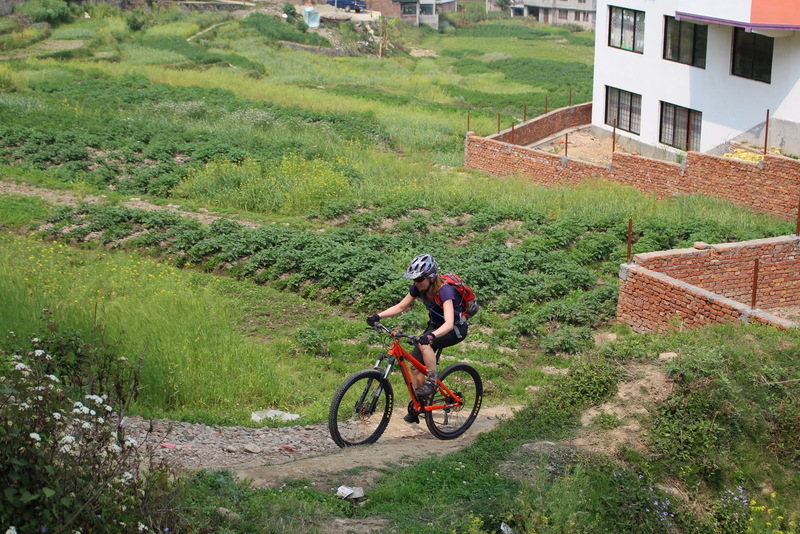 The great thing about the adventure ride was to simply get a glimpse of the everyday life of people living just outside of the capital. It was amazing how fast we got out of the big city and into a greener landscape. 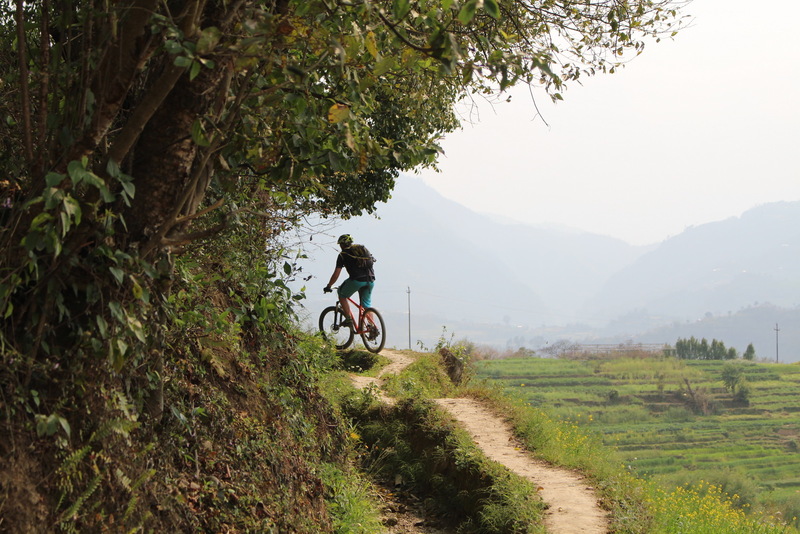 Riding the narrow singletrack next to the canals was challenging, akin to riding a narrow snowshoe trail on a fat bike or riding a skinny in a bike park. Often, we had exposure on both sides, which kept things plenty interesting. 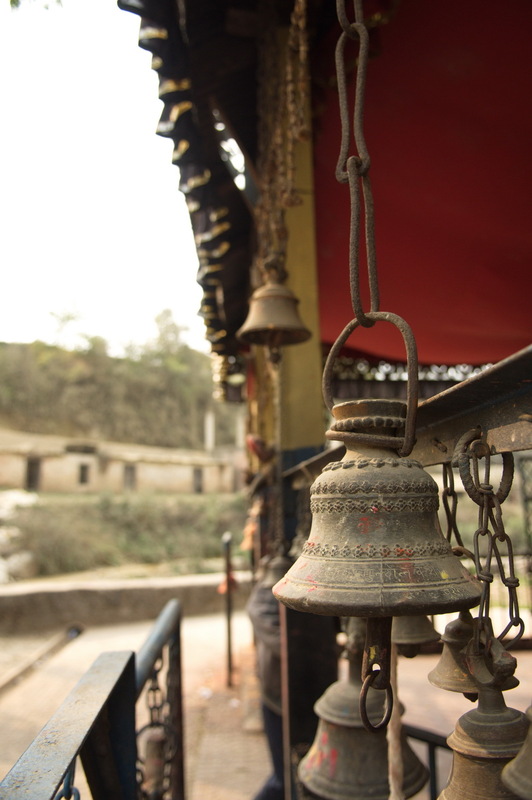 We stopped twice for tea and to visit a small local Hindu temple. 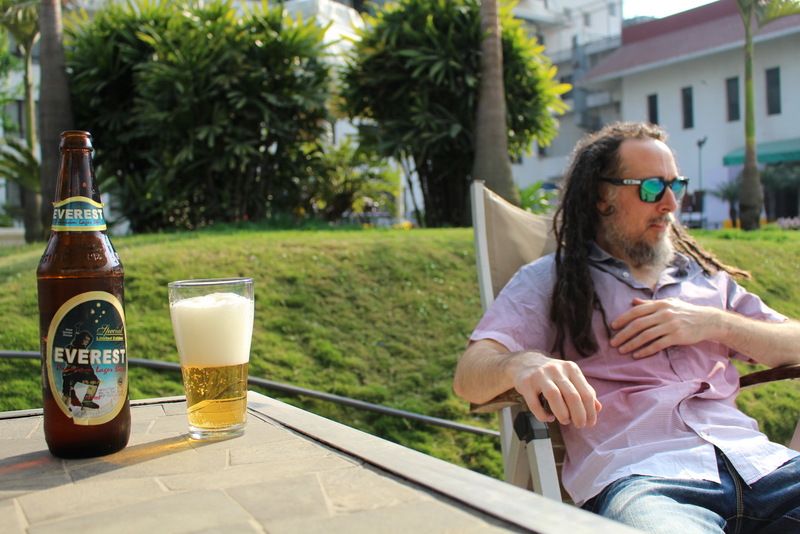 Our guide was explaining to us how the Hindus (religious majority) and the Buddhists in Nepal actually get along quite well. 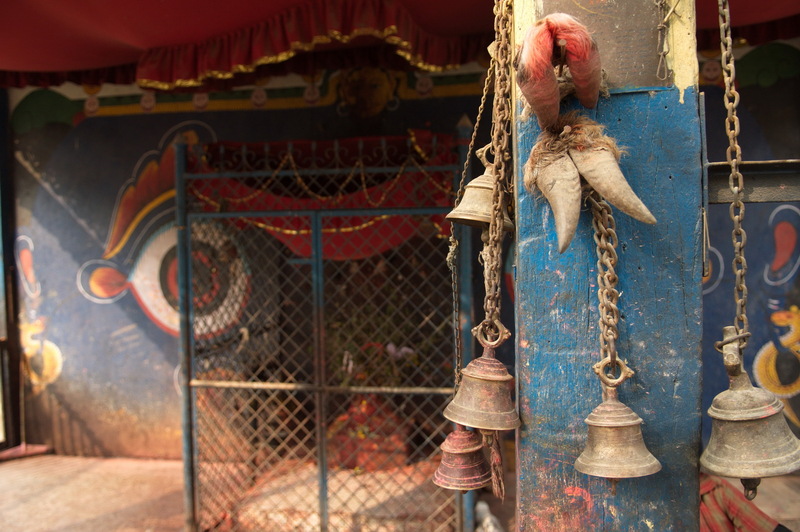 You can even find carvings of one’s religion in the other’s temple. We also crossed our first of many suspension bridges. 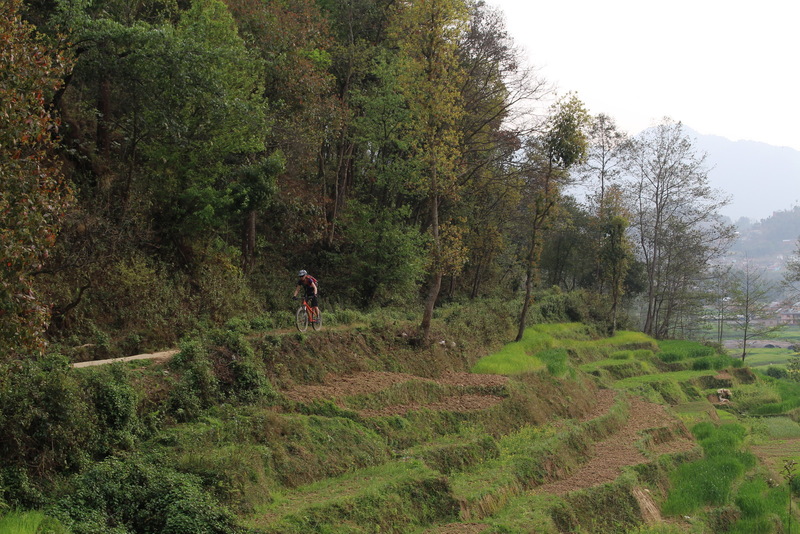 The return journey was mostly downhill on roads, and it was quite fun to draft behind speeding trucks and zip down the valley. Once we got into the city, the skies opened and we quickly found shelter to wait out the storm. We were thrilled about our first ride. 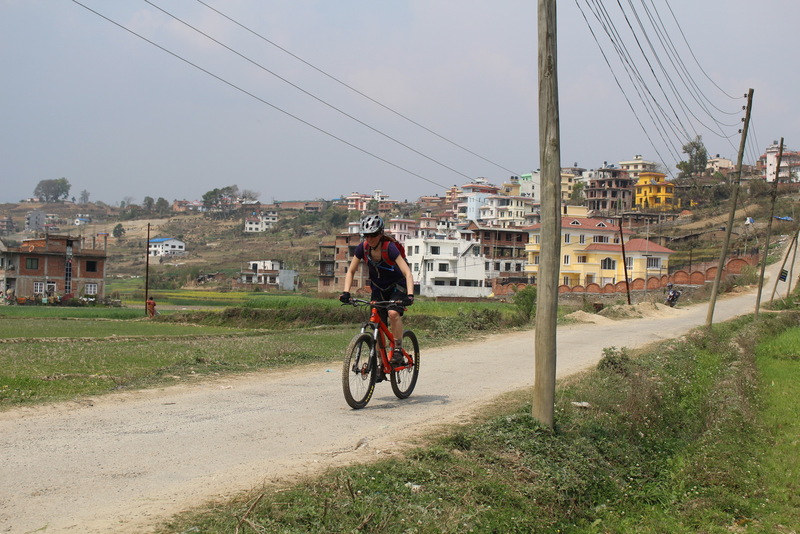 In total, we rode around 35 km and it was the perfect way to get the legs going and to get the feel of Nepal. 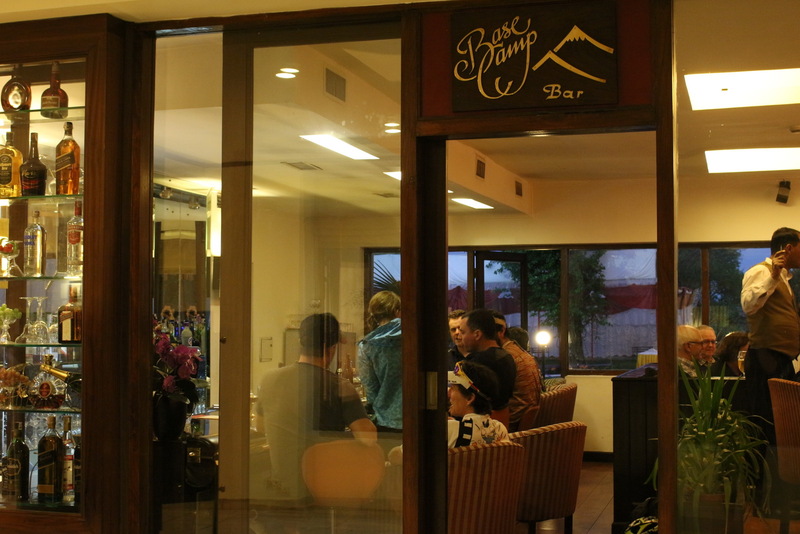 Once back at the hotel, we went to the appropriately named ‘Base Camp,’ just in time for happy hour. Happy we were indeed! Tomorrow we’ll be heading to the renowned Mustang region, our main destination for this trip.